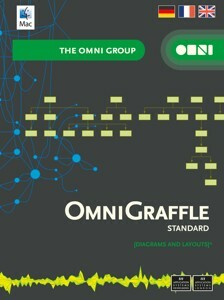 Product information "OmniGraffle 7 Standard, update, academic (download)"
OmniGraffle can help you make eye-popping graphic documents--quickly--by providing powerful styling tools, keeping lines connected to shapes even when they're moved, and magically organizing diagrams with just one click. Create flow charts, diagrams, UI and UX interactions, and more. Whether you need a quick sketch or an epic technical figure, OmniGraffle and OmniGraffle Pro keep it gorgeously understandable. Related links to "OmniGraffle 7 Standard, update, academic (download)"